Prepare rice noodles according to instructions on box. Return broth to heat and bring back up to boil. You can do this in the pot using the sauté setting or on stovetop. Place noodles in a heated bowl. Place equal amounts of uncooked steak into bowls. Do the same with the noodles. Pour boiling broth over steak (this is what cooks the meat) and allow to sit for a minute or two. 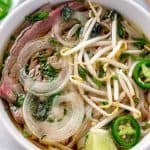 Top each bowl with any combination of sliced onions, cilantro, basil, mint, and scallions. Serve immediately! For garnish - use any combination of bean sprouts, limes, jalapeno, basil, mint, hoisin sauce, and Sriracha.